October 31, 2013 – The Chicago Bulls today announced its 2013-14 season promotional schedule featuring giveaways for fans attending home games. 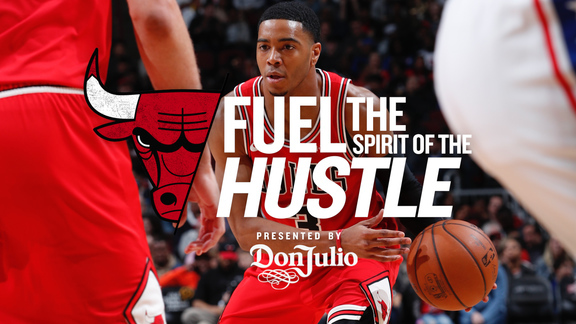 Starting with Opening Night, the team and their corporate partners will provide unique Bulls-themed items to fans to thank them for their support. All items will be distributed while supplies last. Fan favorite giveaways such as player bobbleheads will be back again this year, including the first Jimmy Butler bobblehead and a special edition Joakim Noah St. Patrick’s Day bobblehead. There will also be a Benny the Bull bobblehead sponsored by Advocate Children’s Hospital in honor of Benny’s birthday bash in March. This season will feature a series of five “Shirt off our Back” games, sponsored by BMO Harris Bank. At each game, fans entering the United Center will receive a promotional scratch & win card, and five lucky winners will get a signed authentic Bulls jersey and one hundred fans will win replica jerseys. Each of the five nights will be dedicated to a different player: Carlos Boozer, Jimmy Butler, Luol Deng, Joakim Noah and Derrick Rose. Tickets for every Chicago Bulls home game can be purchased through Bulls.com, NBATickets.com, 1-800-4NBA-TIX, the United Center and Ticketmaster. For a schedule and more information, visit Bulls.com/tickets.